The 23rd Area Support Group was inactivated in June 2006, casing its colors during a ceremony on 15 June 2006. The 6th Ordnance Battalion was reassigned as part of the reorganized US Army Materiel Support Center - Korea. The 194th Maintenance Battalion was reorganized and redesignated as the 194th Combat Sustainment Support Battalion and became a part of the similarly reorganized and redesignated 501st Sustainment Brigade. The 23rd Area Support Group mission was to conduct noncombatant evacuation operations (NEO) of US Citizens and allied nationals if required, to conduct Reception, Staging, Onward Movement, and Integration (RSO&I) in the groups AOR and assigned TAAs, and to establish and operate GS LOGBASEs. It also provided direct support maintenance (DS), aviation intermediate maintenance (AVIM), as well as supply support for Class I, II, III, IV, VII, and IX products throughout the theater of operations. It performed ammunition stock accountability, visibility, and surveillance for all US titled munitions in support of EUSA and ROKA. On order, it provided title transfer operations, DS/GS ammo support to EUSA, and CIS to ROKA and US Marine Forces, Korea. The 23rd Area Support Group was headquartered at Camp Humphreys in Pyongtaek, 130 miles northwest of Taegu. The 23rd Support Group was also responsible for the 6th Ordnance Battalion and the 194th Maintenance Battalion. The 23rd Area Support Group was originally constituted as Headquarters and Headquarters Company, 23rd Direct Support Group in the Regular Army on 24 November 1965. 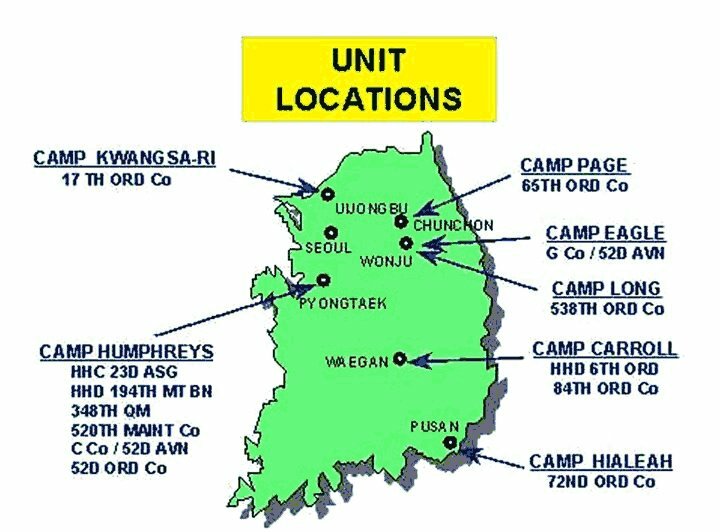 The unit was activated on 1 January 1966 in Korea. The unit was reorganized and redesignated as Headquarters and Headquarters Company, 23rd Area Support Group on 4 May 1971. On 15 November 1974, the unit was inactivated in Korea. The 23d Area Support Group was reactivated on 16 August 1985 at Camp Humphreys, Korea. As part of the transformation of the 19th Theater Support Command to the 19th Expeditionary Support Command, the 23rd Area Support Command was inactivated in June 2006. This coincided with the reorganization and redesignation of the 501st Corps Support Group as the 501st Sustainment Brigade. The 194th Maintenance Battalion was subsequently reassigned to the 501st Sustainment Brigade, reorganized and redesignated as the 194th Combat Sustainment Support Battalion. The 6th Ordnance Battalion was reassigned to the the reorganized US Army Materiel Support Center - Korea.